Many Europeans and news media elites in America believe that the future of the Arab world now belongs to the trendy Facebook generation kids of Tahrir Square, Tunisia and Morocco. But such wishful thinking is naïve to the extreme. Tunisia and Morocco elected Islamist governments. Egypt has now elected an Islamist government. When Syria falls the Moslem brotherhood will most likely seize power. The Brotherhood’s Palestinian power (Hamas) now controls the Gaza strip and is a constant thorn in the side of Israel. The Nation of Jordan is now vulnerable to an Arab uprising and there is considerable unrest in the tiny Island nation of Bahrain. Saudi Arabia fears Iran, which has long wanted to overthrow the ruling Saudi family. The Middle East has changed in ways unthinkable just 3 to 4 years ago. The Moslem Brotherhood, once held in check is now the ascending power in the region. Yes, it is true dictators have been removed from power, but this is no guarantee that more sane and rational governments will now rule in the Arab word. Most likely you will see Arab governments become more anti-American, and certainly more anti-Israel. 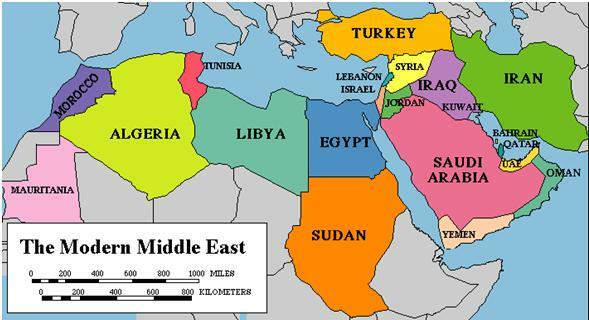 The whole Middle East region has become more unpredictable and dangerous. Moderate Islam can quickly morph into radical Islam, the type demonstrated by the repression and extremism of Taliban Afghanistan, Islamist Sudan and the fanatical mullahs of Iran. The true character of the Arab world includes a proclivity to fight and seek out conflict. Notice a prophecy in the Book of Genesis regarding the descendants of Ishmael: But God sent a message to Hagar, assuring her that her son would live and nations would come from him. He said to her, “I will so increase your descendants that they will be too numerous to count … You are now with child and you will have a son. You shall name him Ishmael [which means ‘God hears’] for the LORD has heard of your misery. He will be a wild donkey of a man; his hand will be against everyone and everyone’s hand against him, and he will live in hostility toward all [of] his brothers” (Genesis 16:10-12). This description of Ishmael’s descendants is very significant because many of today’s Arabs are descendants of this same Ishmael, whose father was Abraham. Muhammad, the founder and the prophet of Islam is a descendant of this Ishmael, the son of Abraham by Hagar. The Moslem Brotherhood is growing in power in the Middle East—this fact is no small threat to Israel and American interests in the region.